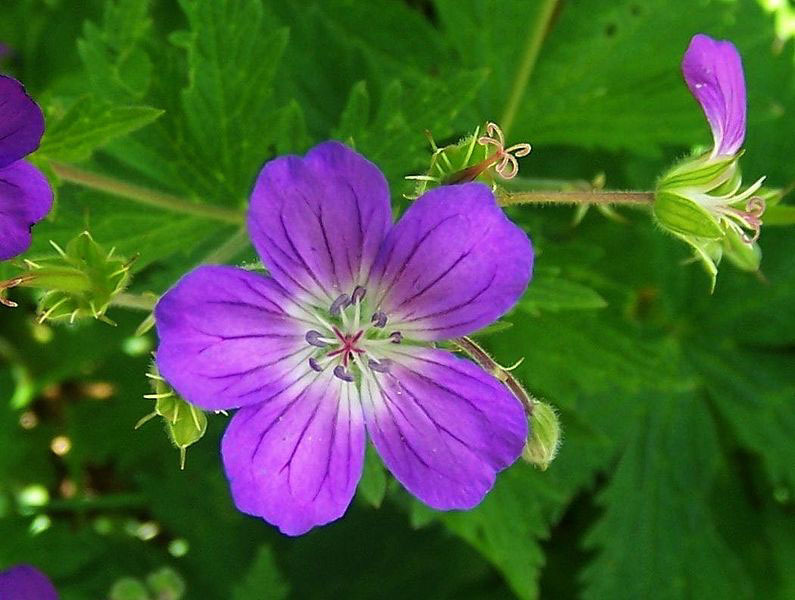 Geranium Sylvaticum – A Highly Adaptable and Lovely Garden Flower! Geranium sylvaticum is commonly known as woodland cranesbill or wood cranesbill. It is a wild geranium species that belongs to the genus Geranium (Cranesbills). Geraniums and pelargoniums (scented geraniums) are members of the Geraniaceae family. Geranium sylvaticum is a perennial herbaceous plant that is native to Europe to Western Asia. It also grows way up north in arctic regions and likes to grow anywhere from coastal regions to mountainous regions. It is very similar to Geranium pratense (meadow cranesbill), which is another common wild geranium species. Because this is a wild species, this plants fits very well into a near-natural garden and is a superb food and nectar plant for insects like butterflies, bees, bumble bees and beetles. It is a tough and all round plant that does not need much care and is very easy to grow. It can grow up to 1 m in height. The color of the flowers varies depending on the soil conditions. The colors range from mauve to blue and the centre of the flower is whitish. Generally, it blooms from May to July, but they may bloom earlier and later. This highly adaptable plant can be grown under hedges and beneath trees and shrubs. They cover the ground and are also good border plants and container plants. The plants are tough but they dislike very dry and very wet soils. Keep the soil evenly moist and water them when it is needed. How often you have to water them depends on where the plants are growing (sun or shade) and how hot it gets during the day. Grow them in partial sun to shady places. And it is best to put them in a sheltered position. Trim the plants if the flowers and foliage suffer and get ragged during summer time. This will rejuvenate the plants and the flowers and foliage will grow back nicely. Propagation: The seeds are best sown in spring and the adult plants can be divided in spring or fall. Pruning: Deadhead them before the flowers grow seeds and trim side stems to prevent an excessive self-spreading. Cut them back to ground in fall and cover them with a layer of compost soil that is about 2 to 3 inches (5 to 8 cm) thick every few years or put a very small layer of compost mulch every year after cutting back. Geranium Argus (Aricia eumedon/Plebejus eumedon): The larvae feeds on various wild geranium plants. Chequered Skipper or Arctic Skipper (Carterocephalus palaemon): The adult butterflies feed on the nectar of the plants. Clouded Apollo (Parnassius mnemosyne): The adult butterflies feed on the nectar of the plants.